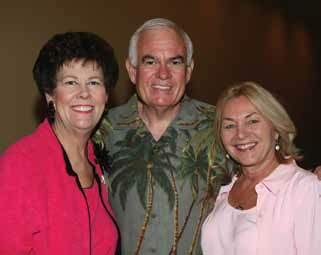 Mayor Richard Crotty at A Taste for Learning with Toni Jennings and his wife Pam Crotty. Like many Central Floridians, Richard Crotty’s parents moved to Orange County to seek a better life for their family. His dad took a job with defense contractor Martin Marietta in 1960 when Richard was in sixth grade, and Richard and his four brothers were raised in South Orlando. Richard Crotty is a product of Orange County Public Schools, where he graduated from Oak Ridge High. Upon graduation, he took a job on the assembly line at Martin Marietta. He aspired to obtain a college education, so, after working a few years, he began taking classes at Valencia. He put himself through school working two different jobs driving delivery trucks. One of Valencia’s early graduates in 1970, he graduated from Florida Technological University (FTU), a member of the charter class, in 1972 with a bachelor’s degree in public administration and communication. The next year, Richard was selected to the Florida Legislative Staff Internship Program, where he completed a graduate executive program in public administration. He worked on the Senate staff and completed his service as a member of the U. S. Army Reserve, serving in a military police unit. Upon his return to Orlando, Richard launched a successful career in sales and management consulting. For the next three years, he consulted for cities across the country under a grant from the U. S. EPA. He is credited with saving cities millions of tax dollars by improving the efficiency of their solid waste collection systems. Recognized as an up-and-coming leader for his work in our community, Richard was selected for the first Leadership Orlando class at the age of 27. By age 30, he was elected to the Florida House of Representatives. He served in the Florida House for 12 years. His accomplishments were many, but the ones he is most proud of involve his passion for education and his love for the community that provided him and his family a better way of life. In 1990, Richard ran for Florida Senate and was elected overwhelmingly. During his years in the House and Senate, Richard was known as a reformer and consensus builder. His first legislation changed the name of FTU to UCF. Rep. Crotty was prime sponsor of a bill creating the first U. S. prepaid college tuition program in America, which allows parents to purchase a college education for their children well before they go to college. The Florida Prepaid College Tuition Program gives families hope of a college education and the financial ability to make it a reality. He also sponsored the Rios-Martinez Act, which guaranteed that sexual predators of children would not get early prison release. In 1992, he won election as Orange County’s Property Appraiser and was re-elected in 1996 and 2000. As property appraiser, he is credited with using state-of-the-art technology to maximize efficiency and provide higher levels of service to the citizens of Orange County. He managed 127 staff and a budget of $8 million and was responsible for assessing the value of approximately 320,000 pieces of property, valued at $43 billion. And while property appraiser, Richard attended the executive program for state and local government at the John F. Kennedy School of Government at Harvard University. On January 8, 2001, Florida Governor Jeb Bush appointed Richard to succeed Mel Martinez as Orange County Chairman – he took the official oath of office on January 24, 2001. Richard T. Crotty served as Orange County Mayor from 2001 to 2010. (The title changed from county chairman to county mayor in 2004.) While mayor, he was responsible for the day-to-day operations of the county government, overseeing nearly 7,300 employees with an annual budget of $3.4 billion. During his tenure, he focused on transportation, schools and the economy. He helped drive the plan to fund the new Amway Center, the Dr. P. Phillips Performing Arts Center and the renovation of the Citrus Bowl. In spite of many large-scale accomplishments, Mayor Crotty considers his most significant achievement to have stewarded Orange County through the preparation for, response to, and recovery from three major hurricanes in six weeks during the summer of 2004. And in spite of those many large-scale achievements, he remains humble and was quoted as saying that he wanted “to leave the place better than I found it” as he transitions from public service to private life. Richard’s awards include the Distinguished Alumnus and Distinguished Service Award from UCF and the Leroy Collins Distinguished Alumnus award from the entire Florida Community College System. Richard is most proud of the Allen Morris Award, bestowed on him by a secret vote of House colleagues as the most effective member of his party. During his tenure as Orange County property appraiser, he was ranked the No. 1 property appraiser in the nation with the Distinguished Assessment Jurisdiction Award. He also received the Public Information Award. Mayor Crotty takes every opportunity to promote Valencia and his relationship as one of the first graduates. It is prominently listed in his bio and emerges frequently in public speeches and personal conversations. He is also a donor, having funded an endowed scholarship in honor of his parents. He also expanded a Valencia / UCF Two-Plus-Two scholarship with a major gift to Valencia Foundation. Richard has also pledged to help increase available transfer resources for Valencia graduates. And Richard Crotty himself stands as a perfect example of that balance: someone who achieved greatness, because of the access and opportunities afforded him at a community college.